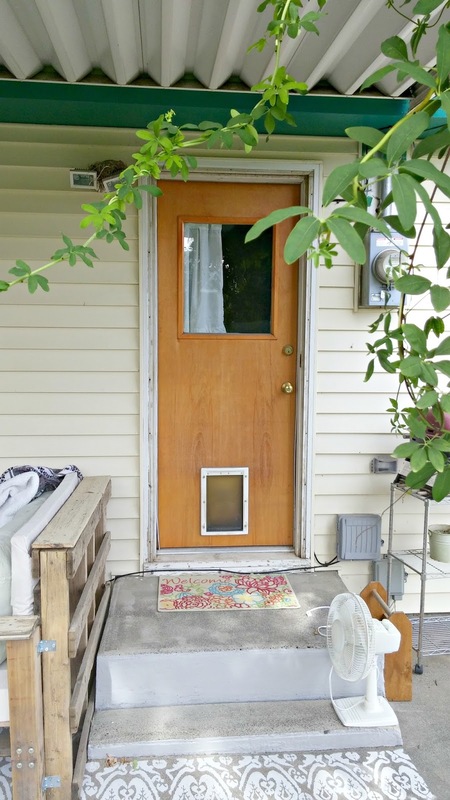 Do you know what catnip and and a door have in common? 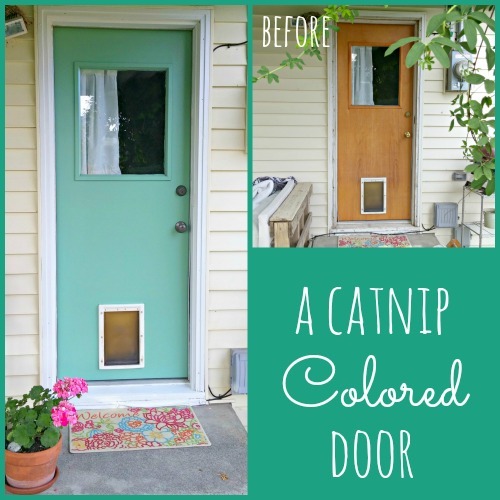 Nothing unless you are painting a door with a color called catnip!! 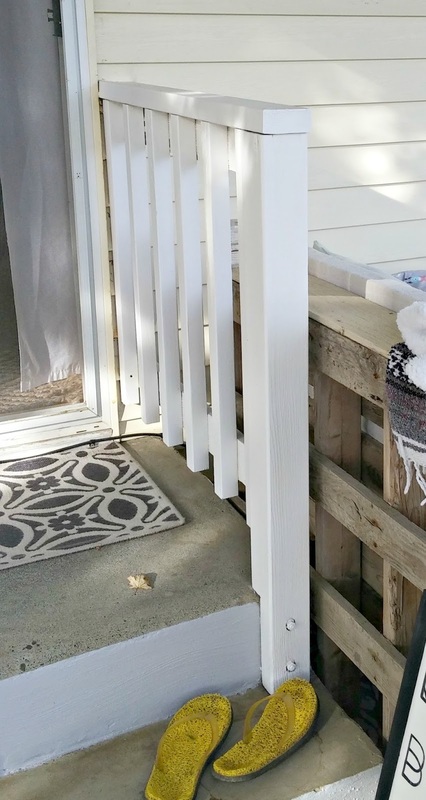 When I shared my DIY Inspirational Quote signs I painted for my boho patio makeover I said I'd be sharing the newly painted door into the laundry room and the railing next to the sliding glass door, both of which are part of the patio. 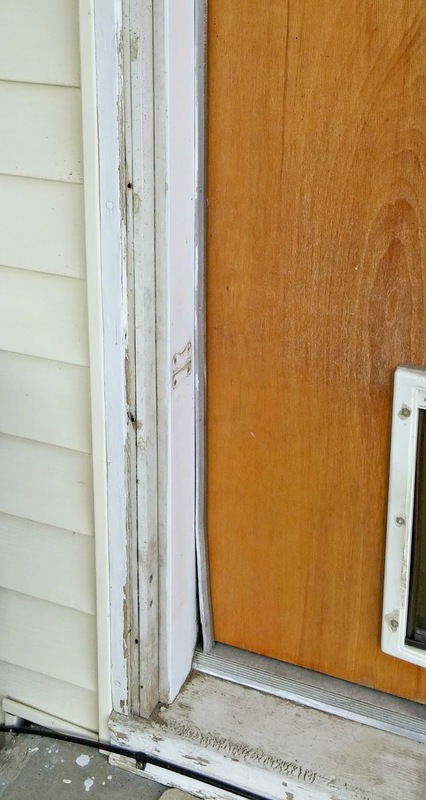 And the door casing and molding was just as bad with peeling, dirty paint :o( It was in desperate need of a makeover. 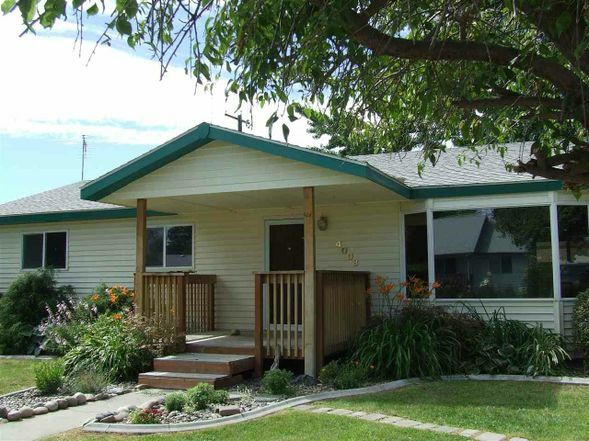 My house has vinyl siding that is a very, very light, buttery yellow color and the trim and soffits along the top of the house are currently painted the ugliest green ever. Here is a good shot of that. Well, next year I'm planning to paint that green trim grey. I'll be leaving the buttery yellow color. 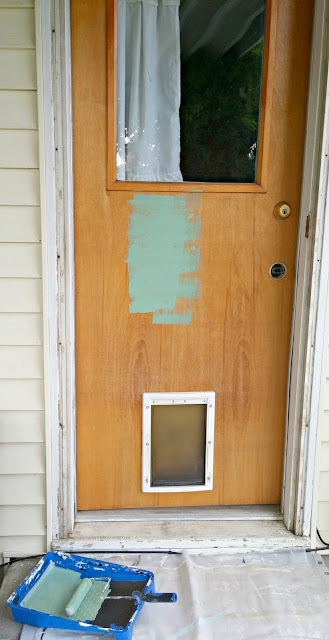 So, in the meantime I tried to pick a color for the door that wouldn't clash too bad with the garish green that's there now and look good with the grey trim next year after it's painted. The door casing and molding got a fresh coat of Glacial Ice and I removed the doorknob and deadbolt and spray painted them with Rust-Oleum Hammered Metal Finish in Dark Bronze ... nice right? Next up for a makeover was the railing next to the sliding glass door. It had been stained at one point but wasn't looking too nice anymore. It got the same Glacial Ice color. It took about 4 coats!!! 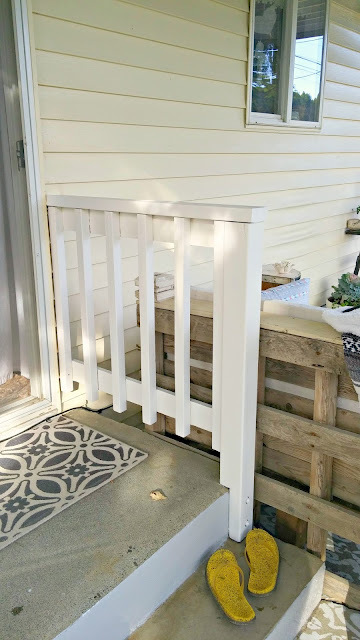 The old stain on the wood bled a little bit but this paint has primer in it already so after a couple of coats that stopped. It's Olympic brand in case you are wondering. I've been playing around out here trying to figure out the best place to put my new pallet love seat. 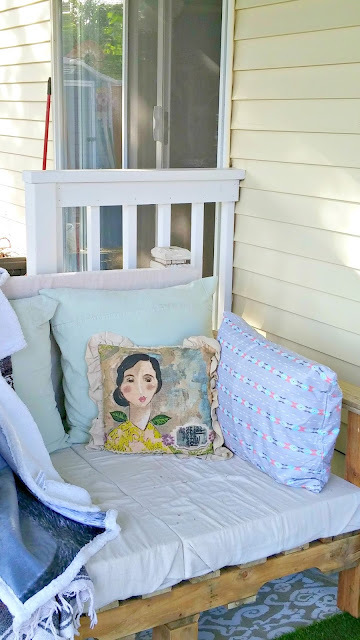 I want to be able to sit and admire my pretty backyard and all the hard work I've put into it but the love seat is kind of large so it can't go just anywhere! Wow, looks so much better!! Great job Tania! Very pretty! Love the catnip color! It looks great! I suppose you are going to paint that house trim yourself! Love all your new colors. I didn't know catnip was a color, but it looks good. Looks like it matches your floor mat. Love that color! It is looking so good! Thanks Florence! I think I will paint the trim myself! You know me so well! ha ha! Tania that made a huge difference. 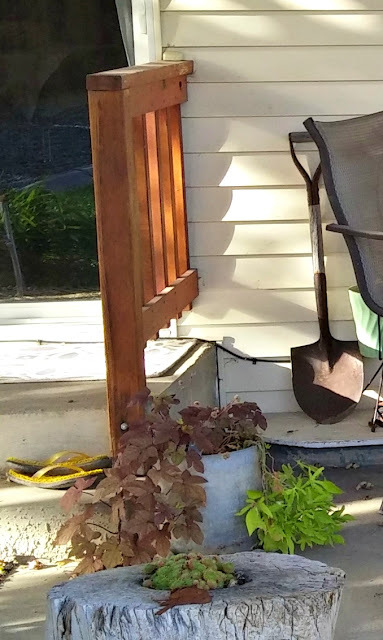 It gave the door a pop of color and reated a focal point. ANd you did good in painting the railings white. Now they will not fight with the door and your beautiful pallet couch.